Dimensions: 11 1/6" x 8 3/4" x 9 1/8"
Don't forget to bring in your old battery into Walmart to avoid the core fee. Dimensions: 11 1/6" x 6 3/4" x 9 1/8"
Dimensions: 12 7/8" x 6 3x"4 x 9 1x2"
Dimensions: 13" x 6 3/4" x 10"
Dimensions: 8 1/4" x 5 3/16" x 7 3/16"
Dimensions: 4 1/2" x 2 13/16" x 3 1/8"
Dimensions: 4 1/2" x 2 11/16" x 4 5/16"
Dimensions: 5 1/8" x 3 5/16" x 6 1/8"
Dimensions: 5 7/16" x 3" x 5 9/16"
Dimensions: 5 1/8" x 3 9/16" x 5 1/4"
Dimensions: 5 3/8" x 3 9/16" x 7"
Dimensions: 6" x 3 7/16" x 4 3/16"
Dimensions: 6 7/8" x 4" x 6 7/8"
Dimensions: 6" x 3 1/2" x 5 1/8"
Dimensions: 8 1/8" x 3 9/16" x 6 3/8"
Dimensions: 4 7/16" x 2 3/4" x 5 1/8"
Dimensions: 4 7/16" x 2 3/4" x 4 1/8"
Dimensions: 6" x 3 7/16" x 5 1/8"
Dimensions: 6" x 3 7/16" x 4 1/8"
Dimensions: 6 7/8" x 3 7/16" x 6 1/8"
Dimensions: 6 7/8" x 3 15/16" x 6 1/8"
Dimensions: 6" x 3 7/16" x 5 7/5"
Dimensions: 10 3/4" x 6 13/16" x 9"
Dimensions: 9 1/16" x 6 15/16" x 8 7/8"
Dimensions: 10 3/8" x 7 3/16" x 8 1/8"
Dimensions: 10" x 6 1/16" x 8 3/8"
Dimensions: 10 1/16" x 7 3/16" x 6 15/16"
Dimensions: 9 1/2" x 6 15/16" x 6 15/16"
Dimensions: 10 3/8" x 7" x 8 5/8"
Dimensions: 10 3/4" x 6 13/14" x 9"
Dimensions: 10 1/4" x 6 13/16" x 7 7/8"
Dimensions: 12 1/16" x 7 9/16" x 7 9/16"
Dimensions: 9 1/16" x 7 1/16" x 7 5/16"
Dimensions: 10 1/4" x 7 1/16" x 7 5/16"
Dimensions: 8 1/4" x 7" x 8 1/2"
Dimensions: 12 1/16" x 6 13/16" x 8 7/8"
Dimensions: 10 1/4" x 6 13/16" x 8 7/8"
Dimensions: 9 3/8" x 5 1/16" x 8 3/4"
Dimensions: 10 1/16" x 7 11/16" x 7 3/4"
Dimensions: 9 1/16" x 6 13/16" x 8"
Dimensions: 9 9/16" x 6 7/8" x 7 1/2"
Dimensions: 11" x 6 7/8" x 7 1/2"
Dimensions: 13 15/16" x 6 7/8" x 7 1/2"
Dimensions: 13 11/13" x 6 8/9" x 7 12/25"
Dimensions: 12 7/16" x 6 15/16" x 7 1/2"
Cold Cranking Amps measures a battery’s ability to start an engine in cold temperatures. The higher the CCA rating, the greater the starting power of the battery. 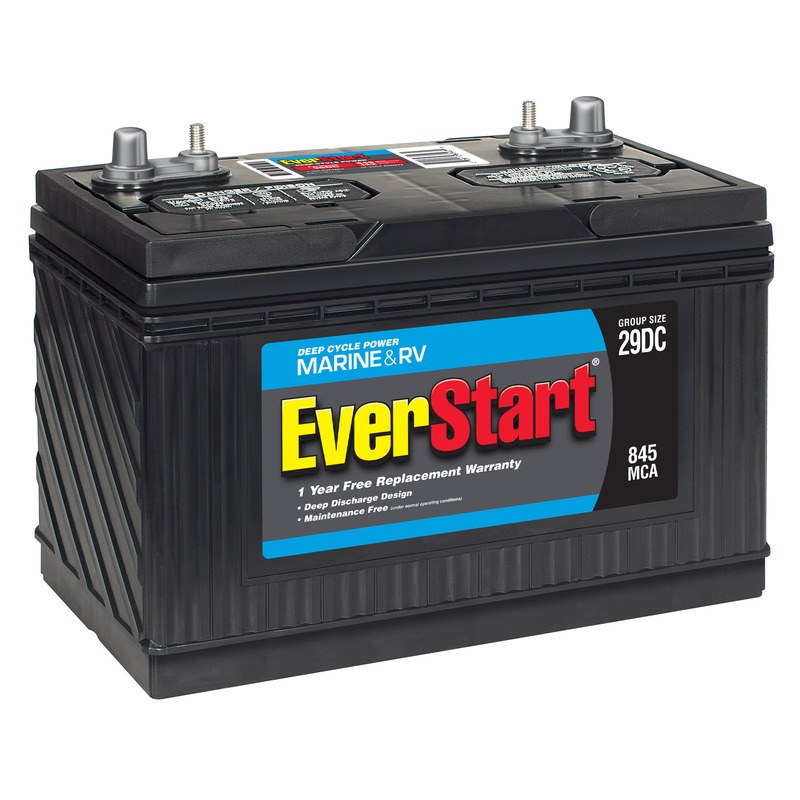 Marine Cranking Amps is a rating that defines a marine battery’s ability to deliver a large amount of power for a short period of time. 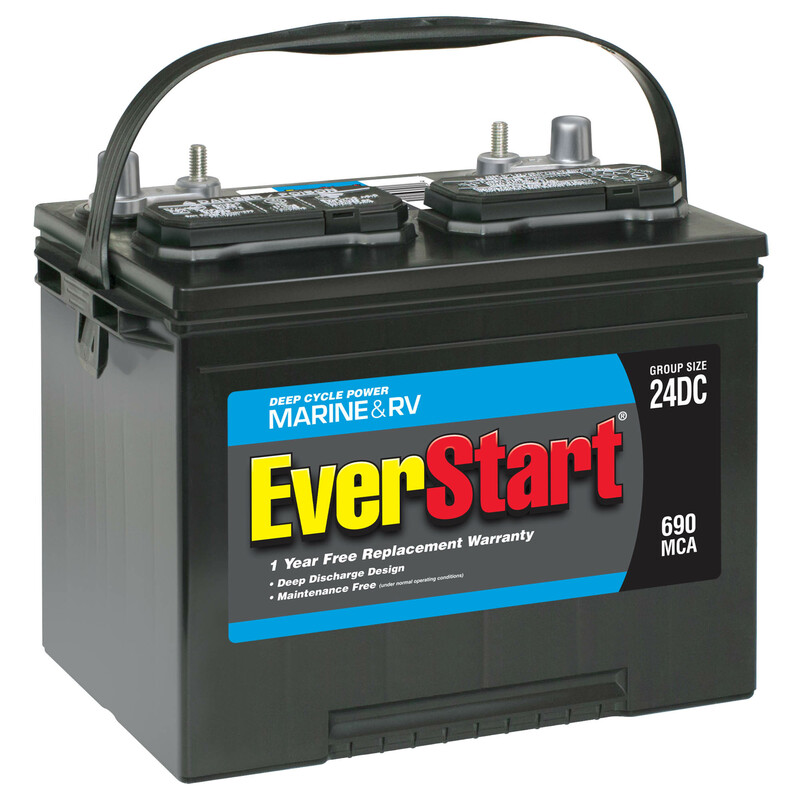 Since marine batteries are typically never used at temperatures below freezing, marine cranking amps are measured at 32° F as opposed to 0° F for cold cranking amps. Reserve Capacity is how much electric charge (or energy) is stored in a battery. A battery with a higher RC rating can support electric devices longer before needing to be charged. Repetitive Reserve Capacity is the total number of times a battery is completely discharged and recharged until it is capable of less than half of its rated reserve capacity (RC). 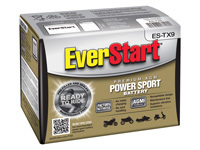 Use the fields below to tell us about your vehicle and we'll select the EverStart Maxx battery that's right for you. You depend on your battery to get you started everyday. If it stalls, so do you. Get a reliable battery at an affordable price. Use our battery finder and provide your vehicle's make, year, model and engine size. Then print your battery match information and bring it into your local Walmart. You can also just write down your vehicle's make, year, model and engine size and bring it to the store. One of our trained professionals will be happy to help you find the battery you need. If you like, they can even install it for you at no charge. Whenever you’re handling or working with a lead-acid battery, consult your vehicle and battery owner's manual for instructions and safety precautions. Lead-acid batteries contain hydrogen-oxygen gases that can be explosive and sulfuric acid that can cause severe burns. Wear ANSI* approved safety glasses or goggles and a face shield. Wear proper clothing to protect your face, hands and body. Cigarettes, flames or sparks could cause a battery to explode. Keep all ignition sources away from the battery. Always shield eyes and face from battery. Do not charge or use booster cables or adjust post connections without proper instructions and training. In event of accident, flush with water and call a physician immediately. To know the difference between the negative and positive battery terminals and the negative and positive clamps of the jumper cables. Positive is indicated by a (+) sign, the words "POS" and the color red; negative is marked by a (-) sign, the words "NEG" and the color black. The colors may vary, but are red (+) and black (-) in most instances. Pull the cars next to each other so they're not touching and turn off both ignitions. Connect the positive clamp of the jumper cable to the dead battery's positive terminal. Connect the other positive clamp of the cable to the positive terminal of the battery in the starting vehicle. Connect the negative clamp of the cable to the negative terminal of the battery in the starting vehicle. Connect the other negative clamp of the cable to the vehicle's engine block, or other metal surface of the car-away from the battery. This metal surface is exclusive of the carburetor or tubing on the car with the discharged battery. This serves as your ground or connection point. Make certain all cables are clear of fan blades, belts and other moving parts of both engines and that everyone is standing away from the vehicles. Start the car of the battery providing the jump-start; then try to start the car with the dead battery. If the car starts, allow the engine to return to idle speed, then remove the cables in the reverse order that you put them on. Remove the negative clamp on the ground of the car that needed the jump. Remove the negative clamp on the assisting vehicle. Remove the positive clamp from the assisting vehicle. Remove the positive clamp from the formerly stalled vehicle. If the car doesn't start, wait a few moments and try again. If it still doesn't start, you probably need a new battery. To charge an automotive battery, refer to your car owner’s manual and your battery charger manual for instructions. Review the safety instructions that came with your charger and battery. Remember that batteries contain sulfuric acid that can cause severe burns, and hydrogen-oxygen gases that can be explosive. Remove the ground (black) cable first. Use the proper size box or open wrench when removing the cables. Place the new battery into position. If original battery has a cover or heat shield, place on new unit. Re-tighten the hold-downs until snug. Connect the positive (red) cable to the positive post of the battery. Connect the negative (black) cable to the negative post of the battery. If you like, one of our trained professionals can install it for you at no charge. You can bring any lead-acid battery into Walmart and we will dispose of it for you at no charge. If you purchase a new battery during the same visit, you can also save on the core fee. Answers to all your battery questions. • How does a battery work? A battery stores energy in chemical form that can be released on demand as electricity. This electrical power is used by the car's ignition system for cranking the engine. Once the car is started, the alternator will power your vehicle, giving your battery the opportunity to recharge and get ready for the next vehicle start. 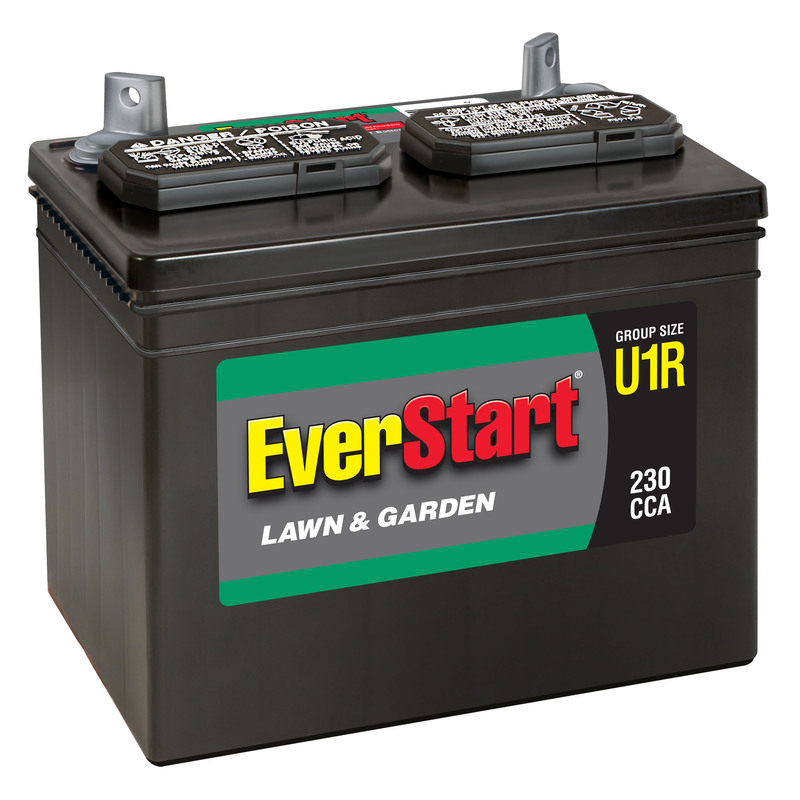 • When my car won't start, how do I know for sure if my battery really needs to be replaced? Many other problems can keep a car from starting, so you need to do some troubleshooting. Most Walmart locations will not only test your battery for free, but can perform a free System Check as well. • What should I consider when buying a battery? The Battery Finder on this site will provide you with a battery recommendation. What are the Cold Cranking Amps required to power your vehicle? Always meet or exceed your vehicle’s manufacturer minimum requirements. 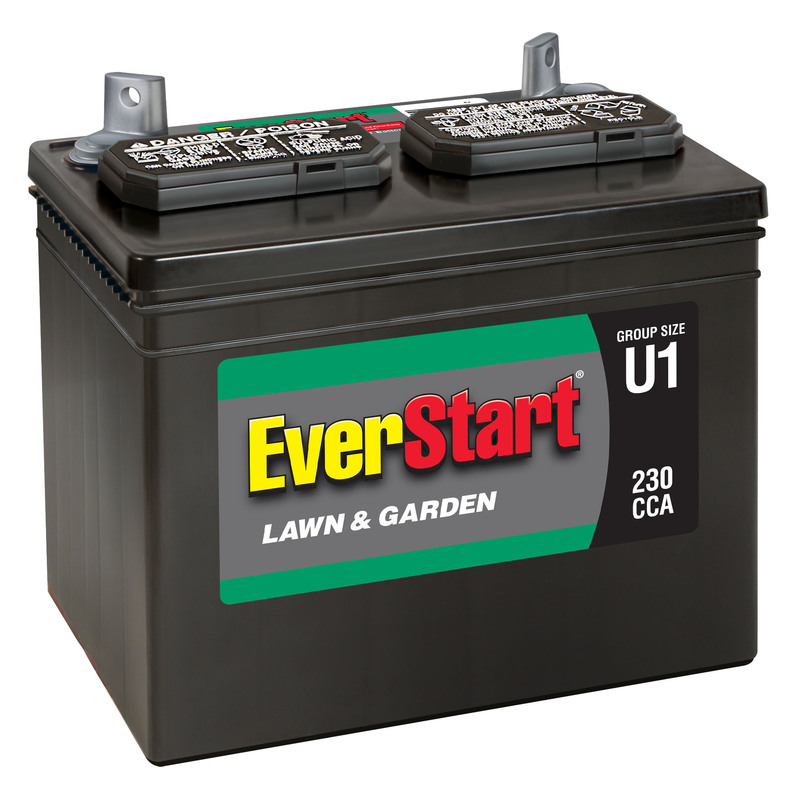 Automotive batteries are backed by a warranty package. Choose what is right for your needs. • What does Cold Cranking Amps mean? Cold Cranking Amps is a rating used in the battery industry to define a battery's ability to start an engine in cold temperatures. The rating is the number of amps a new, fully-charged battery can deliver at 0° Fahrenheit for 30 seconds, while maintaining a voltage of at least 7.2 volts, for a 12 volt battery. But don’t worry, we will make sure that the battery we sell you meets or exceeds your vehicle’s manufacturer minimum requirements. • How do I dispose of my old battery? • Why do some of the model numbers end in either an (N) or (S)? Model numbers that end in either an (N) or (S) are specifically designed for maximum performance in either the northern or southern regions of the U.S.
• How long should a battery last? CLIMATE: Starting a vehicle or boat in colder climates tends to be hard on batteries. For that reason, many people put their vehicles or boats away for the season, but forget to properly charge their battery before doing so. Hotter climates tend to discharge and dry out batteries quicker and average climates tend to be the best for long battery life. USAGE: A battery that is used every day has the most chance of living a long life. Batteries that sit a lot, many times are neglected. This shortens overall life. Periodic charging is the best defense. APPLICATION: How well is the battery charged in the vehicle? Some vehicles have better charging systems than others. Are there a lot of extra accessories on your vehicle? Sometimes a battery has a hard time keeping up with additional electrical drains, thus wearing it out quicker. LACK OF CHARGING: Lack of proper charging is the main reason that a battery will not last as long as it should. At the very minimum, a battery should be charged once a month if left unused. COMPLETE DRAIN: Have you ever left your key on, and totally killed the battery? If recovered in a short time period, the battery should charge back to 100%. But every time this happens, it is similar to the battery having a "heart attack", and shortening its overall life. Always turn your vehicle off with the keyed ignition switch, not the "kill switch". • Are there steps I should take for maintaining my battery? • How do I properly store my battery if I won't be using my vehicle for an extended period of time? If the vehicle is in storage or used infrequently, disconnect the battery cable to eliminate drain from electrical equipment. Charge the battery every two weeks. For extended storage, remove the battery from the vehicle and charge to 100%. Charge the battery every month if stored at temperatures below 60° F. If stored in a warm area (above 60° F), charge every two weeks. Make sure batteries are stored out of reach of children. • Who makes Walmart's lead-acid batteries? Walmart's quality automotive batteries are supplied by Johnson Controls, the world's largest lead-acid battery manufacturer. • What is a core fee? Depending on the state you live in, if you do not bring in your old lead-acid battery to exchange when purchasing a new battery, you will be charged a core fee. The purpose of the fee is to encourage people to return old batteries for proper recycling, which helps protect the environment from hazardous materials in the batteries. 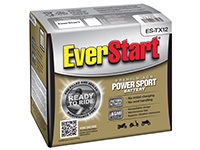 Extend your time on the water with proven EverStart quality power! ** Under normal operating conditions. • What does CCA mean? Cold Cranking Amps (CCA's) measure a battery’s ability to start an engine in cold temperatures. The higher the CCA rating, the greater the starting power of the battery. • What does MCA mean? 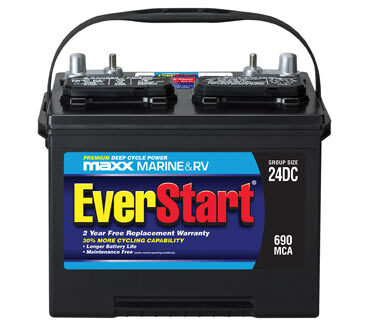 Marine Cranking Amps (MCA's) is a rating that defines a marine battery’s ability to deliver a large amount of power for a short period of time. 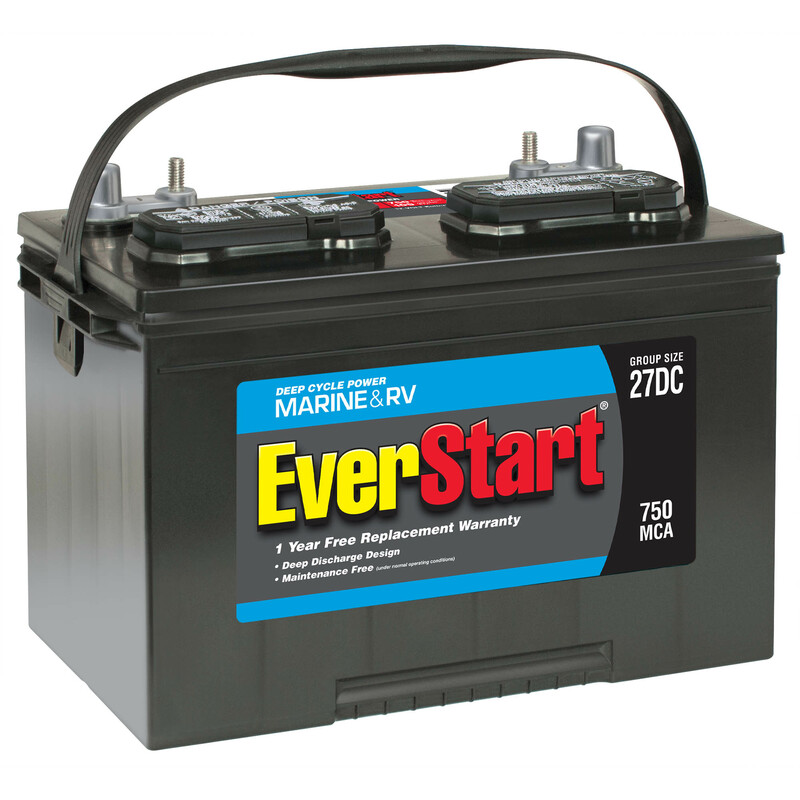 Since marine batteries are typically never used at temperatures below freezing, marine cranking amps are measured at 32° F as opposed to 0° F for cold cranking amps. • What does RC mean? Reserve Capacity (RC) is how much electric charge (or energy) is stored in a battery. A battery with a higher RC rating can support electric devices longer before needing to be charged. • What does RRC mean? Repetitive Reserve Capacity (RRC) is the total number of times a battery is completely discharged and recharged until it is capable of less than half of its rated reserve capacity (RC). 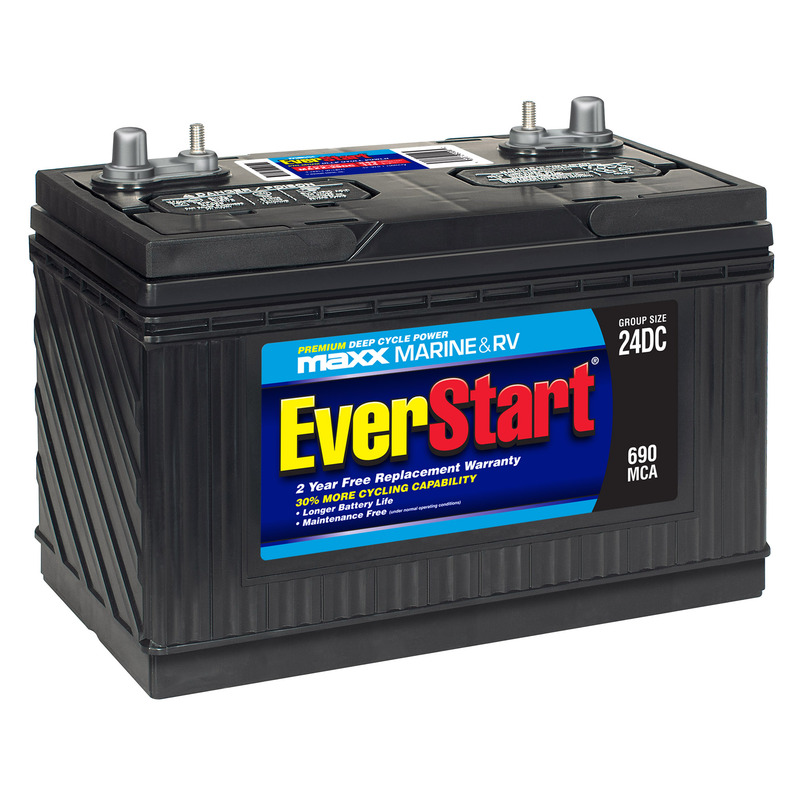 • What is the difference between a starting and a deep cycle battery? 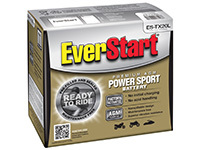 Starting batteries are specifically designed to deliver sudden bursts of engine starting power. The engine’s charging system keeps the battery at capacity while boating. Starting batteries are not intended for low current draw electronics when the engine is not running. 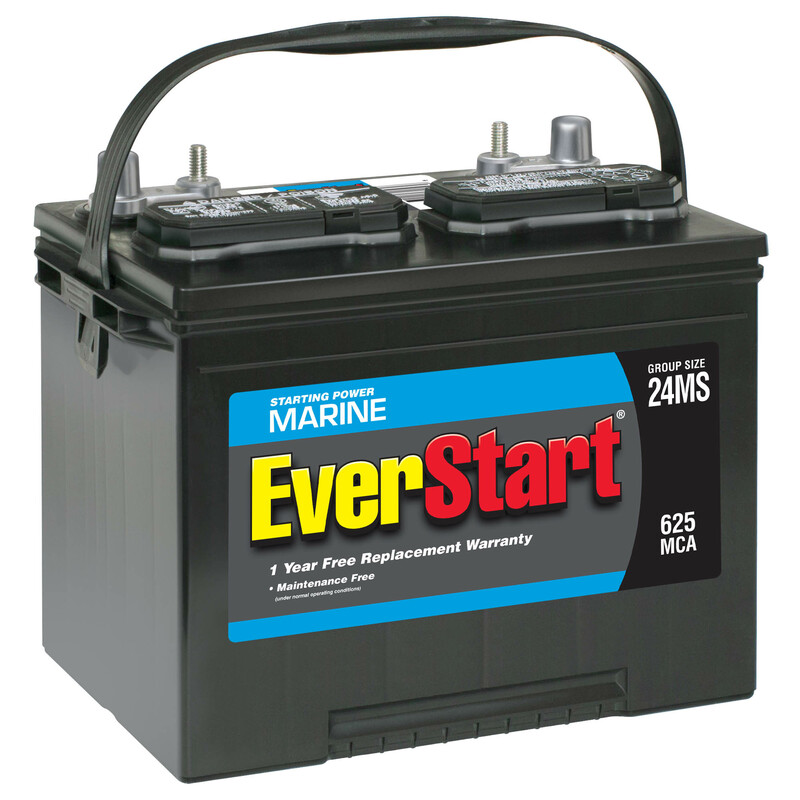 Deep cycle batteries are designed to start your boat and power accessories when the engine is not running. Deep cycle describes the battery's ability to be deeply discharged before being recharged. This discharge/recharge process is known as completing a full cycle. 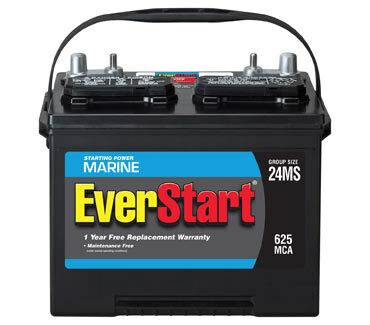 Walmart's quality marine batteries are supplied by Johnson Controls, the world's largest lead-acid battery manufacturer. 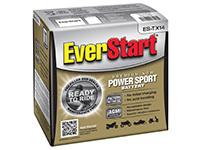 Use the fields below to tell us about your vehicle and we'll select the EverStart battery that's right for you. Use the fields below to tell us about your vehicle and we'll select the battery that's right for you. Walmart's quality lawn and garden batteries are supplied by Johnson Controls, the world's largest lead-acid battery manufacturer. Walmart's quality batteries are supplied by Johnson Controls, the world's largest lead-acid battery manufacturer. Your version of Internet Explorer is not supported by this site. Click here to download the latest version.